On Monday, June 25th, all heroes could talk to Khuddar Khamundi in Battleon to get tickets for the Guardian of Energy set and Treasure Pack. 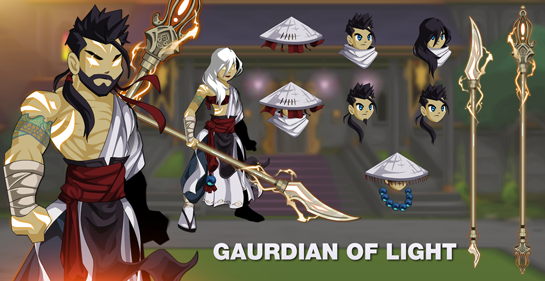 Guardian of Energy prize winners will automatically receive their Book of Lore and character page badges, and can buy their 0 AC set items from the badge shop. 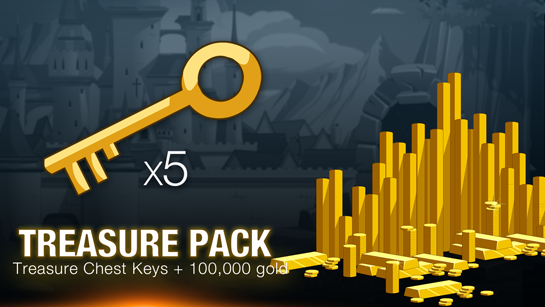 Treasure Pack prize winners will have their 5 Treasure Chest Keys and 100,000 gold automatically added to their inventory and account. If you do not win one of the above prizes, 3 60-minute Class Points boosts will be directly added to your inventory. Love. Loss. And a Darkness that will change the fate of the world... This is Sepulchure the DoomKnight's story. This weekend, log in and battle as Sir Valen through the Ebonslate Fortress dungeon. Complete the quest set by a Mysterious Stranger to destroy Dethrix the Monster King and rescue the woman you love. Time is short, but DOOOOOM is forever. After you complete this weekend's release, talk to a Mysterious Stranger* to begin farming for this weekend's 0 AC rewards. The Doom Seals and Monster Blood are used to complete A Mysterious Stranger's farming quests. If you have Sepulchure's Undead Blade, you can accept his quests to create new variants of the blade. 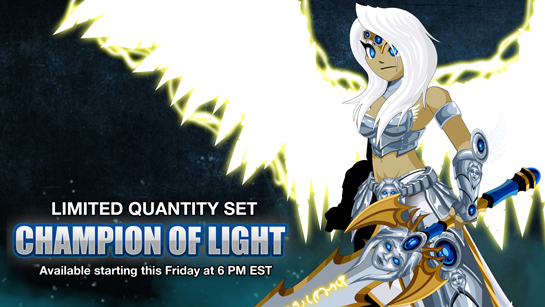 If you are a verified Guardian in AQWorlds** then head to the verificiation shop Guardian Tower to get your FREE 0 AC updated Prime Guardian Armor set. We've updated the colors to match more of the gear in-game. Removed rare items from Seraphic War Chest Shop - Paragon Jester Helm, Legion Bunny on your Back, Seraphic Bunny on your Back. Surfboard of the Nation and Surfboard of the Legion re-added to their respective shops. Saturday... Chakram Dagger! quest description updated. Valencia’s Realm Gems text box fixed and cleaned up. Dark Hood of the Fallen non-CC bit fixed. Mexico Spirit Cape changed to correct flag colours. Argentina Spirit Cape changed to correct flag colours. StormBringer armour skin is not CC because it was not intended to be CC. Thyton’s Magitech Scythe being a sword was intentional. Prime Galactic Scythe and Void Avenger Scythe are held the way the artists intended. *See also This Previous Post for more info. Log in this weekend to find our new 2018 Summer Surf items. 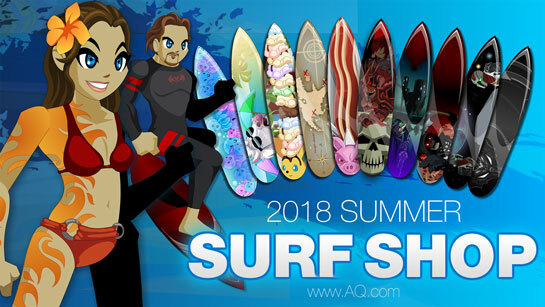 Get the Flame Tattoo armor, all-new surfboards, the ShadowScythe Surfer armor, and more at www.AQ.com! Summer 2018 Gear is Here! These boards will return each year along with the rest of our seasonal summer items. These boards will only be available during our Summer 2018 events. Once Summer ends, these boards will be gone forever. Battle Brutalcorn in the /battlewedding map for a chance to get this 0 AC surfboard for a limited time. Find the Treasure Map in your AdventureCoin shop in the game menu to unlock 13 armors, the Map of Lore Surfboard, and more! 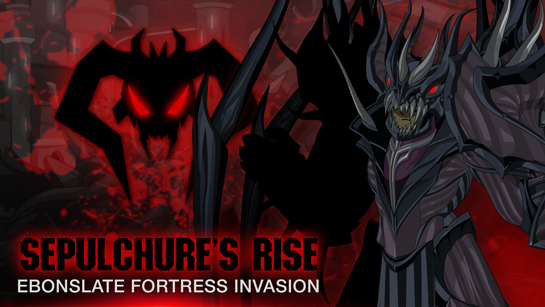 This weekend, we continue the Sepulchure's Rise origin story with part III - the attack on Ebonslate Fortress! Battle as Sir Valen - the knight who would become Sepulchure - and choose between your love for the Healer Lynaria and your loyalty to your best friend, Sir Alteon. 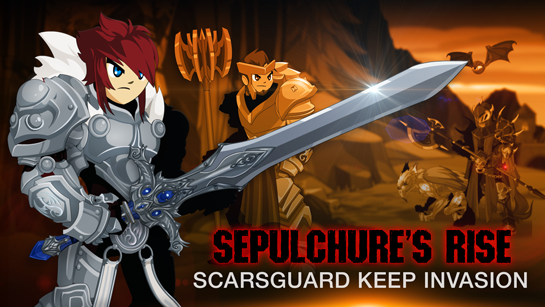 Log in this weekend and /join Valenschoice to begin Part III of the Sepulchure's Rise Saga! Will you fight to save Lynaria? Or battle to save the town of Highwick? Your choice will determine how far down the path to Darkness you descend. But no matter which direction you choose... Dethrix, the Monster King, will be waiting. This weekend: battle the Ebonslate Bruiser miniboss in /ebonslate for a chance to get the pieces of the ShadowStealer armor set, or get the rare ShadowReaper Guard cape (shown above) instantly from your Featured Gear Shop for AdventureCoins. Last week, you fought as Sir Valen alongside Sir Alden Alteon and the Healer Lynaria on a quest to find and defeat the true Champion of Darkness. This week... Choose between love and loyalty, and prepare to confont Dethrix, the Monster King. Next week... Continue your descent into Darkness as you battle deeper into the dungeons of Ebonslate Fortress. At long last, we're building Artix.com into the all-game hub it was meant to be. Get all our weekly update news and the new Artix Games Launcher at www.Artix.com. Evil never looked so Good! 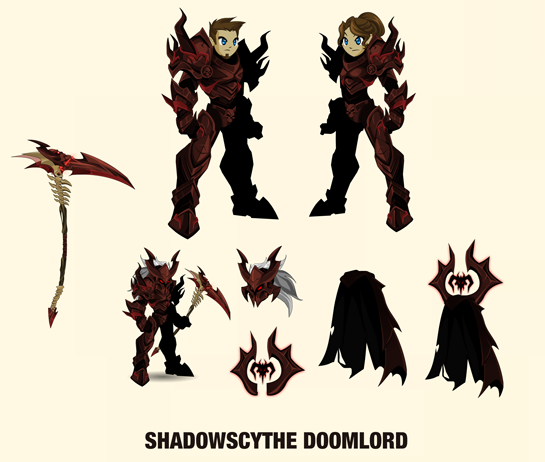 Starting this Friday, June 1st, at 6 PM EST, unlock the ShadowScythe DoomLord + ShadowScythe Warrior armor sets when you buy a 12 month membership or 12,000 AdventureCoin package. Plus, get up to 50% more bonus AdventureCoins with select AC packages until July 6th, 2018! Unlock the ShadowScythe Warrior armor set when you buy any AdventureCoin or Membership package of $10 USD or more. The ShadowScythe DoomLord bonus gear goes rare June 29th, 2018! Cutscene issues in Newfinale fixed. Arrows that flew off have been replaced in Newfinale. Carnage has his buttons back. Enchanted Void Overlord hand CC fixed. Battle through the Valley of DOOOOOM! 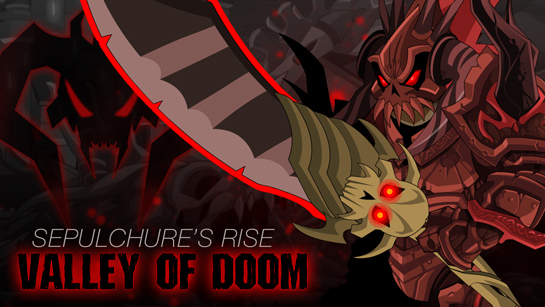 Sepulchure's Rise, the story of how a simple knight became the dread DoomKnight Sepulchre, continues this weekend! Quest as the heroic knight Sir Valen to defeat the Champion of Darkness. 1.) Give yourself 100pts for paying good attention. Good job! 2.) Put on your anti-spoiler hats and get ready for a plot roller coast. Last week in part 1... which was not actually part 1. We were not ready with part 1 yet, so you sorta had a prologue, prequel, part 0 where you played as Lynaria or Alden. The adventure really starts this week. Remember that scroll you unlocked after playing through the story? The one that says Alden and Valen defeated Dethrix-- the Champion of Darkness? He was defeated, but not dead. Well, he might be undead, but the important part here is that he is not UNDEAD-DEAD. Which is really dead. Even for the dead. Extra dead. As tonight's release goes live our trio of heroes will be on their way to restore the glory of Swordhaven... but that Swordhaven Oracle is really going to metaphorically poo in Valen's cereal. #PROTIP The secret is making sure the Champion of Darkness never finds that BLOOD RED armor with the spikes on it. Ready to start the chain of events that breaks a heroic knight? "What makes a good man go bad.... or in Valens case... worse." 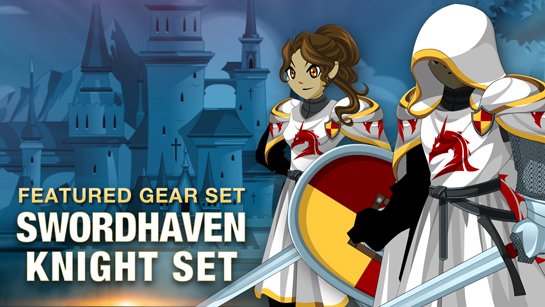 This weekend, gear up and show your allegiance to Swordhaven. 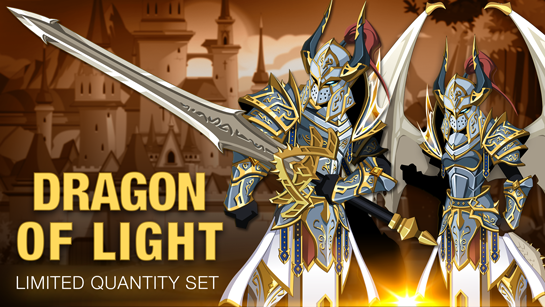 Find Bright Dragon Knight set in the Featured Gear shop for AdventureCoins, and find the rest of the sets from the release merge shop, quests, and monsters. Find the Guardian Tower house for 2,000 AdventureCoins from Penny, the Centaur 21 house vendor in the /buyhouse map. Dage Birthday items (seasonal) removed from permanent shops for now. Typos! Typos! More typos! And a couple more typos too. Sanctified Wings OnMove has been updated to be more wing-like. Cyclops Warlord in /mobius was pulled for two reason. It is not used in any storyline quest originating in this map. Because the map is low level, and this is a boss room, it was killing players who only have AoE classes. He is where he belongs, in /faerie. Pets with CC parts break. There isn’t a way we can fix them reverting to their base colours when you change rooms at this time. On a related note to that many pets do have animations, but are not actual battle pets. Battle pets are clearly marked as battle pets in the item description. 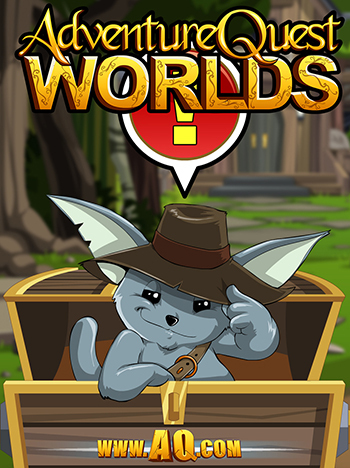 You may also refer to the full list of battle pets located on the AQW Wiki. BATTLE PETS LIST. DoomLord’s Rune is where it was intended to be at. See THIS POST. 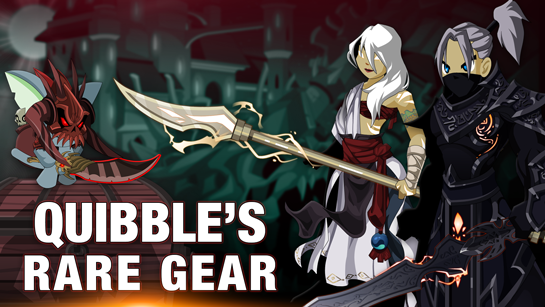 Prepare for DOOOOOOOM with Quibble's Rare Gear! 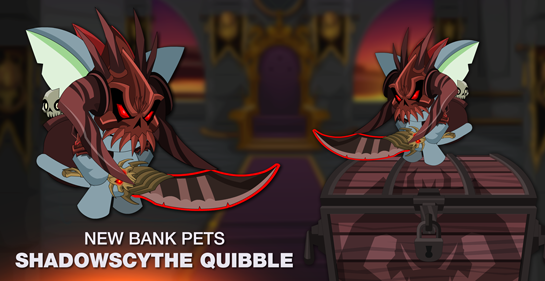 Quibble is in Battleon this weekend, bringing you new Good and Evil gear as we begin this Summer's main event: Sepulchure's Saga: The Rise of Darkness! He's selling most of his gear for AdventureCoins, but has a few things for everyone... if you can meet his price! 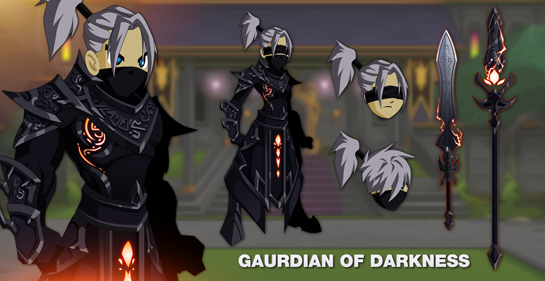 If you've seen Quibble appear before, you know that his arrival heralds the beginning of the next main storyline... so THIS time around, he's bringing gear crafted in honor of the saga's two main elements: light and darkness. The Summer of Sepulchure starts this Weekend! This weekend, log in and battle as Sir Alden or Healer Lynaria as you quest to take over Scarsgarde Keep, the closest fortress to Dreadhaven, home of the Monster King Dethrix! In Sepulchure's Saga, you'll play as Valen. THIS week, you get to chose to play as either Lynaria or Alden, and learn more about how they think and feel as you fight to secure a location from which to launch your attack on the Monster King Dethrix. After you finish playing through the story in /scarsgarde, head back into the Keep battle the Captain for a chance to get the pieces of his armor set! BONUS SCROLL: After you defeat the Captain, /join Crownsreach and make your way to the throne room. You'll unlock a scroll from Drakath, written shortly after he saw the battle between his father and Sir Adlen. Discover the story from his point of view! The Sepulchure's Rise Saga Starts Now! Part 3: Attack on EbonSlate Fortress Will you choose loyalty or love? Part 5: The Shadows Fall Without Darkness, there is no light. Originally, we were going to begin the Sepulchure's Rise saga with Part 2, in the Valley of Doom. But late last week, we saw how much time and care J6 and Ghost were putting into the zone and cutscenes, and we did not want to rush them. The decision was easy - push the initial launch date back a week and release a "pre-logue" to the "prologue." Next week, prepare for DOOOOOOOOM! Fall Dryad Pet has been moved back off you a bit. Crusader Cloak has been reduced to 1 layer when moving. How you obtain the Loremaster houses (other than the tent) had to be revamped. The “upgraded” ones are now on quests. Book of Lore story entry for Poison Mistess now takes you to the proper map. Various typos. Always more typos! Zuthier has been convinced that you can do both sides of the storyline again, and is no longer holding the Solaris shop hostage. Her back button works now as well. ***Special note for Mobius - Once you have completed the storyline and ended the chaorruption, the map will revert to normal for you, no more purple rooms. ***Special Note for Battleontown - Warlic's Cutscene #3 has been fixed, but will go in later when Daimyo's birthday is removed. Lunar BlazeBinder Hair has been brushed to be sleeker. Fishing mini-game is not affected by boosts because this one is coded differently to be able to give the fun game ranks as well as the actual rank. 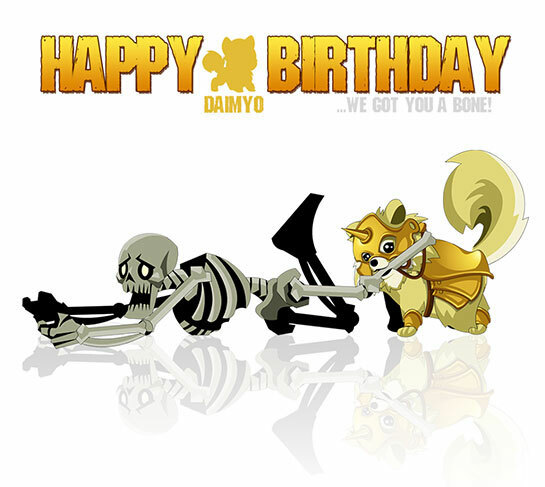 Each year on June 1st, Artix adds Daimyo into Battleon for his birthday, so heroes can buy him as a pet. The real-life pet Daimyo was the inspiration for Daimyo, the Undead Slaying Pomeranian, who appears in many of our video games. This year, when we woke, we found a special surprise in the Battleon Town Fountain. Until Monday, Members can head there to get their own battle companion. On Monday, the fountain will change back to the Daimyo Statue -- where he will live on forever, as an iconic symbol of hope, loyalty, and cuteness. On Monday, a new Daimyo pet will also be permanently added in Artix's Necropolis merge shop - the ShadowScythe Armored Daimyo battle pet. Once upon a time there was a feudal lord from a great Eastern Kingdom. He battled an evil Witch, who cursed him into the form of an adorable puppy. 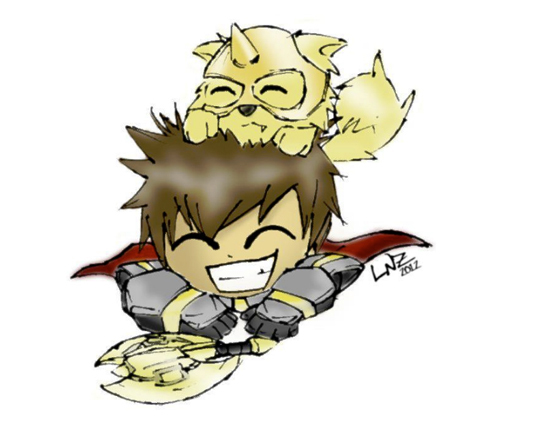 While undertaking the perilous quest to return to normal, he befriended and became the faithful companion of the Paladin, Artix. No one knows Daimyo's secret or what quest is required to return to normal. Mostly because every time he tries to speak it comes out as cheerfully high pitched, "Arf!" A Hero never stops training, and we never stop working to improve what we’ve built. Log in this weekend to see the first round of new improvements designed to help new heroes get the most out of the Oaklore tutorial zone. New and experienced adventurers can battle hordes of skeletons as we bring back the original Undead War! 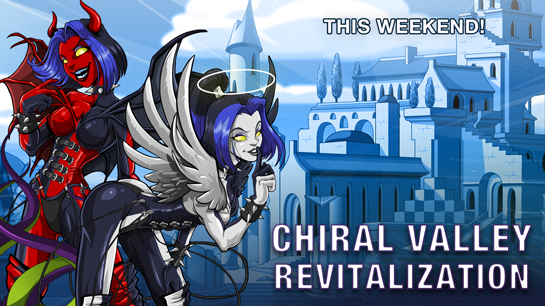 Chaos still seethes in Chiral Valley, and it is up to you to clear it out! This week, the dev team went back to the areas in Chiral Valley to improve the balance and flow of the 1st Lord of Chaos main story saga and side content. Many of the NPCs have had their dialogues updated to help new heroes navigate the storyline more easily. Select monsters and quests have also been rebalanced and adjusted. Experienced heroes (levels 30+) can talk to DewDrop Fairy in /mobius for new high-level farming battles. The higher the level of Hydra you battle, the more HydraSlayer merge shop tokens you'll earn! 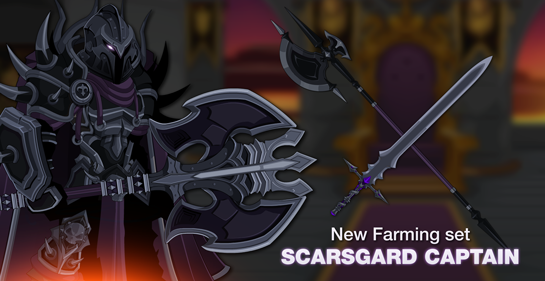 Farm the tokens to create the pieces of the Chaos HydraSlayer set! 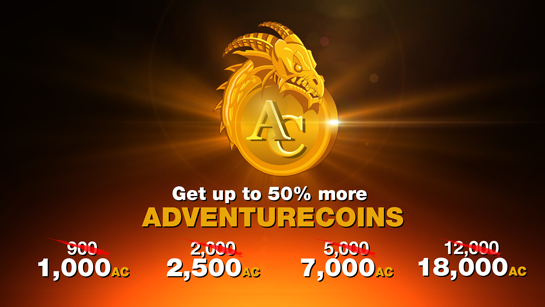 Get up to 50% more AdventureCoins for Free! It's Summer... but despite the sun, AdventureQuest Worlds is eclipsing the sky with our darkest sale ever. 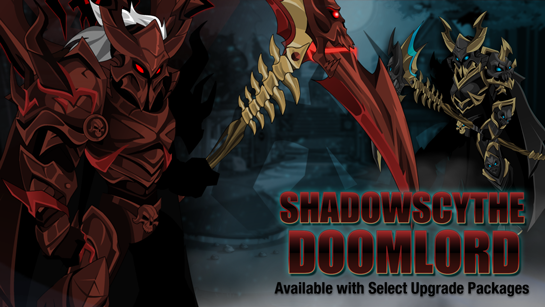 For a limited time only, get up to 50% more Adventure Coins and unlock the ShadowScythe DoomLord item set with select packages. Starting Friday, June 1st, at 12:01 AM EST the Summer Madness AC Sale is ON! 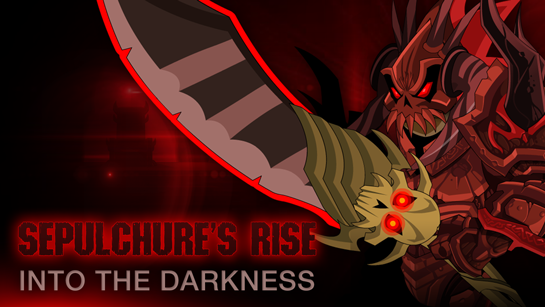 Get more AdventureCoins with each AC package, and the larger the AC package you buy, the more bonus ACs you'll have to spend as we begin our Summer of Evil storyline - Sepulchure: Rise of Darkness!! Note: this offer does not apply to AdventureCoin purchases bought on Amazon.com, or the bonus ACs that come with membership packages. * On June 29th, the bonus amount will drop, so if you're looking to buy AdventureCoins, this is the time to do it!